Click Here To See Marvelmania #5! Check out this INCREDIBLY HISTORIC SILVER AGE MARVEL COVER which was penciled by the great JACK KIRBY! This is believed to be the "ONLY" EXISTING SILVER AGE SPIDER-MAN COVER that Jack Kirby EVER DREW! Many people forget that Jack Kirby was the actual penciler for Spider-Man's first 2 covers ever! AMAZING FANTASY #15 as well as AMAZING SPIDER-MAN #1! Jack Kirby also drew the Covers to Fantastic Four Annual #1 and Strange Tales Annual #2 as well as Amazing Spider-Man #10. All of these covers do not exist! This great piece here was drawn for the ever classic MARVELMANIA #5. This was drawn in the late 1960s by Jack Kirby, and published right before Jack Kirby left Marvel for DC after his differences with STAN LEE! This very cool, very KIRBY-ISH rendition of Spider-Man (without Spider on chest) has all of the great Jack Kirby elements....with incredible machinery all over the place as Spider-Man uses his webbing to hold onto the side of a building in New York City as he punches a big alien in the face! 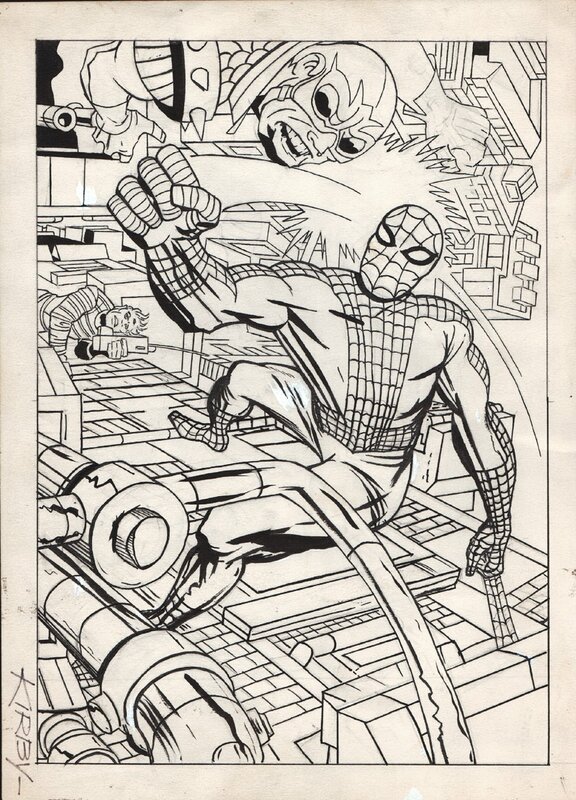 we can also see a SANDMAN looking guy talking below the battle on a giant walkie-talkie This INCREDIBLY historic JACK KIRBY SILVER AGE SPIDER-MAN cover was published as a fully penciled piece (As you can see in the red link above) and was inked later. Cover is drawn on 9.25 by 12.75 art board and is also signed in ink at the bottom by Jack Kirby! 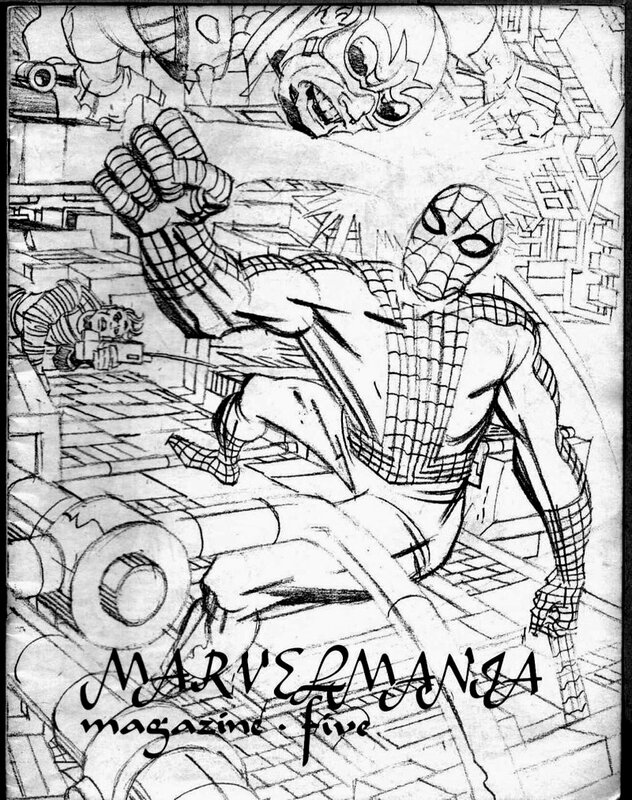 Spider-Man is 1 of the GREATEST SUPERHEROES in the WORLD..... And who wouldn't want to own the "ONLY KNOWN SILVER AGE SPIDER-MAN COVER" by Spider-Man's VERY FIRST COVER ARTIST??? To say this is an HISTORIC ONE OF A KIND PIECE OF ART is quite the understatement! All art on our website (including this one) are able to be purchased with VERY fair time payments, and trades are always considered towards "ANY" art on our website! Just send us an email to mikeburkey@aol.com and we can try to work something out.